He's your best pal and he goes everywhere with you! But muddy paws and moulting fur are big no-nos when it comes to keeping your car seats spotless. So, if you don't fancy hours of scrubbing and hoovering your car's interior, what's the answer? 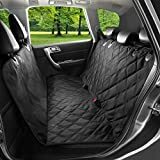 If you love taking your dog along on road trips or even just a quick run to the supermarket, the key to protecting your upholstery and keeping him comfortable is a removable car seat cover. 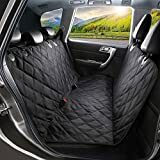 They come in an array of shapes, sizes, colours and fabrics so that you can choose the one that suits your pooch and fits your rear seats perfectly. And, unlike full, fitted covers, these designs can be whipped out for cleaning or for when you need to carry passengers in the back. Love hitting the beach or exploring woodland but hate the ensuing mess? A protective cover is an absolute must if you want to explore with total freedom. 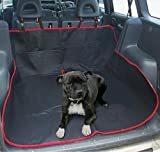 Your beloved dog can get as filthy as he likes and you can pop him happily in the back of your car, safe in the knowledge you can pull the car seat cover out when you get back and give it a good clean. Plus, if your dog is sensitive to travel, a car seat cover is a great way to protect against bouts of car sickness. 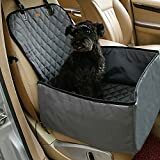 Some people opt for travel cages but if you'd rather allow your pup some freedom in the back, a cover protects you in case you can't quite pull over in time! Those with bigger breeds of dog will need a durable cover that attaches sturdily and stays in place while they move around. It's also wise in all cases to opt for a waterproof design, especially if your pet loves splashing around in rivers and puddles. Don't they all? Many pet owners swear by the popular hammock-style cover. 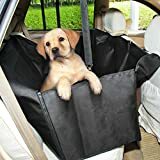 Usually designed in a universal shape, hammock covers attach to the front and rear headrests to create a comfortable resting place for your dog. Some designs have a zip down the middle so that you can split the hammock if you have an extra passenger along for the ride. Most designs will feature slots for seatbelts so that you can secure your pet with a harness for safety. Finally, look for covers that are made from wipeable (or at least easy-to-clean) fabric. Some can be put through the washing machine whereas others are designed to be wiped or brushed clean. Most designs will set you back around £10 or even less. However, if you feel like splurging, there are luxury designs on the market for between £20-£40. Often the more expensive designs will feature padding and boast pretty impressive durability but the cheaper options are perfectly suitable, especially for smaller breeds.